Two lucky homebrewers have won the chance to brew in the Pilot Brewery at St James’s Gate in Dublin next week. THERE’S NO DOUBT about it, it’s up there with professional fantasies like “mattress tester” or “full-time holiday-maker”. Yep, making and tasting different flavours and types of beer for a living is a total dream job. But that’s exactly what’s been happening so far in the ongoing Smithwick’s Homebrew Challenge. And the best is yet to come. The time has come to find out – how did Irish homebrewers rise to the challenge? The concept was straightforward: enter on Smithwick’s website and register to receive a pouch of Admiral hops. Each entrant to the competition had to use these hops to enter the competition. Smithwick’s received 200 submissions to the competition (meaning 200 people were sent out these hops) and were sent back 70 entries in the form of bottled ales. The 70 initial entries have been whittled down to just two. These two will go on to brew their Christmas ale recipe in the Pilot Brewery – where the brewers at St James’s Gate get to experiment and create new beers. On Tuesday 3 November, the time had come to taste and rate all 70 entries. Gathered together in a space on Erne Street in Dublin was the creme de la creme of beer tasting heads – quality control experts and professional brewers from St James’s Gate, bloggers such as Beer Nut and Irish Beer Snob, and members of the National Homebrew Club, including President Thomas Carroll. Refined palates all. Each bottle was being opened for the very first time. For fairness, each entry was kept at the same temperature in a fridge below the judging room, and brought up in rounds for each table of judges to try. The ales had been split according to the ingredient lists sent in – the most popular flavours being cinnamon, honey, chocolate, fruit, nuts, orange peel and spices. To keep things as impartial as possible, the judges were not informed of which group or whose beer they were tasting. Colour gives the initial perception of taste. You’re going to taste it almost before you pick up the glass. And similar attention was paid to all elements being scored. 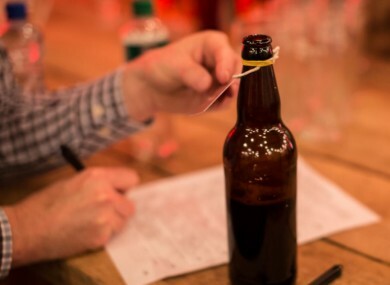 Each and every glass was tasted, and notes meticulously taken on Smithwick’s Homebrew Challenge scoresheets. If youwould like further information about the Smithwick’s Challenge visit www.smithwickshomebrewchallenge.ie or to learn more about homebrewing and to pick up some tips visit www.nationalhomebrewclub.ie. Stick around next week for an update on how the DailyEdge.ie, The42.ie and TheJournal.ie teams got on brewing in our office kitchen. Email “From over 200 entries to just two - after tasting and testing, we're nearly ready to announce our homebrew finalists”. Feedback on “From over 200 entries to just two - after tasting and testing, we're nearly ready to announce our homebrew finalists”.